* Frequent Frog Follower Annie is a double blogger. I mostly follow her Junior Mints and Reese's blog. But she also has a Flyin' Annie blog that details her efforts to follow the FlyLady. She's holding her first give-away that includes some adorable and useful decorative magnets. Go over there and check it out, but don't plan on winning because I already called dibs on those magnets. * Annie is also the one who clued me in to the gadget giveaway at Pennies in My Pocket, where they are giving away a Smart Shopper Electronic Grocery List Organizer. Need mayo? Say it into your Smart Shopper. Need TP? Talk it up into the Smart Shopper. When you go to the grocery, hit print and Smart Shopper spits out a list of everything you've told it -- organized by grocery store departments! It'll also keep a to do list for you. If only the Smart Shopper could actually go to the store for me and then put the groceries away when it gets home. Anyway -- if you don't want to take your chances on winning, you can also visit Pennies in My Pocket (I was going to abbreviate that, but this is a family-friendly blog) to get a coupon code for $25 off the Smart Shopper. * I recently stumbled on Mrs. Furious' blog. She doesn't pretty frequent video blogging, which I might do if I get some decent results from the peer pressure...er, motivation of the 4th Frog Biggest Loser Contest. Anyway, Mrs. F. served up a link to a YouTube series on Depression Cooking (which is NOT baking brownies and eating the whole pan yourself because you're feeling blue). Ninety-three year old (where do the hyphens go in that? I write for a living and I don't know.) Clara demonstrates Depression-era cooking from her circa 1920s kitchen. Even if you don't try any of the recipes, you've got to check this out. * It must be giveaway season in the blogosphere, because Shannon of Gabi's World is giving away Dave Ramsey's Financial Peace Revisited book. Even if you don't need the book, check out Shannon's site...the pic of Gabi adorned in a hot pink boa is sure to make you smile. * I tend to laugh in situations where it's not really appropriate. That's why I can totally identify with Kristi's sister in her blog post about her habit of falling down. Head on over to Not Quite What I Had Planned. If you tend to wet yourself while laughing, go to the bathroom first. Ok. Enough for tonight. Tomorrow is Biggest Loser night (and American Idol Night and the premiere of the Duggar's 18 and Counting show). If you're playing along in my Biggest Loser contest, but sure to e-mail me your fabulous new weights. If I hurry, I can get 3 more hours of sleep before I have to wake up! I gave you an extra entry for blogging about my giveaway, thanks for the love! I just emailed you my weight for the week!! WOOHOO!!! Ooooh! Thanks for the Linky Love! I just love that picture of Gabi, too! Oh yeah! Have you ever tried taking Melatonin? I started taking it a couple weeks ago because I was having horrible insomnia. I swear I am out like a light within a half of an hour of taking it. And it is a natural supplement not an addictive substance. 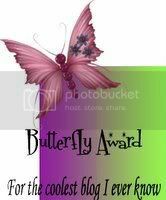 Thank you for the butterfly award! I'm thrilled! Looking forward to your next post on The Biggest Loser!